As I mentioned in my previous post, I had introduced two new HTML import options to control how numbers in cells are detected & converted during import. I had also hinted at the end of the post that I might add the same import options to the CSV import dialog. I’m writing this post to inform you guys that that’s exactly what I just did. which highlights the changes I’ve made. 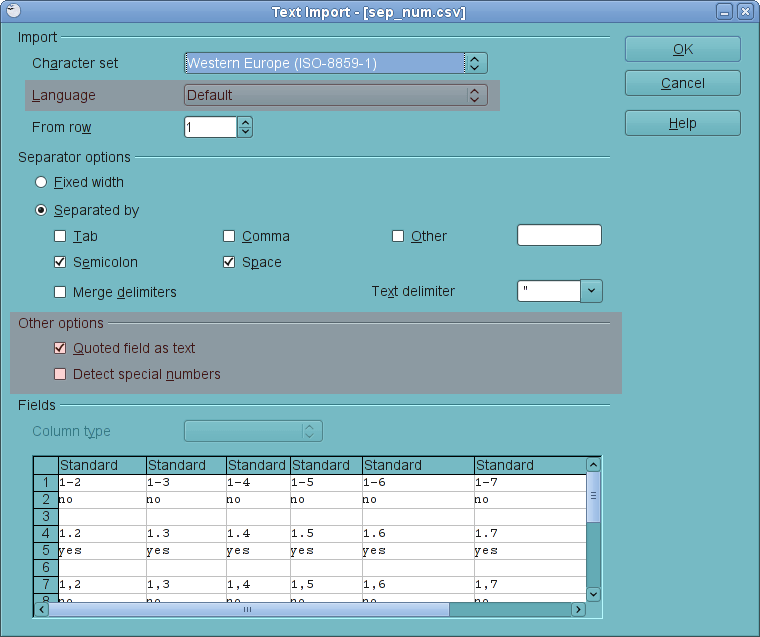 At the top of the dialog is the new Language list box, to select what language to use for the import. If it’s set to Default, it uses the language that OOo uses globally. Similar to the HTML import, this option affects how the numbers are parsed, based on the decimal and thousands separators for the selected language, as well as how the special numbers are detected & converted. I’ll talk more on the special number detection later. In addition to the language option, located in the middle of the dialog are two check boxes to further control how cell values are to be interpreted. Option Quoted field as text, when set, always imports quoted cell values as text, even if they are numbers. This option existed before this change, but was used only for the separator-based CSV imports. It is now used for the fixed width imports as well. Option Detect special numbers, similar to the one in the HTML import option, controls whether or not to detect specially-formatted numbers, such as dates, scientific notations etc. When this option is set, Calc will try to detect special numbers and convert them into appropriate format. When this option is not set, Calc will only convert the simple decimal numbers. By default, this option is not set. Anyway, that’s all there is to it. Hopefully this will solve, or at least make it easier to handle importing of CSV documents, which was previously hampered by Calc’s aggressive date detection and lack of support for alternative number separators. 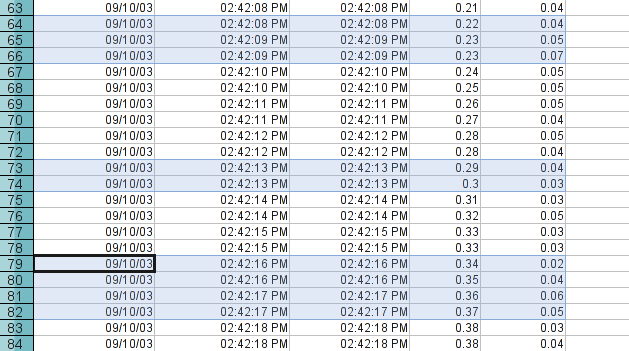 I doubt that this will make your CSV import experience a perfect one, but it will hopefully make it a much better one. New in Go-OO Calc is the ability to copy and paste multi-range selection, that is, you can select separate cell ranges that are not connected with each other, and copy and paste them in one single action. This was not possible previously; when you tried to copy multiple ranges, you would get an error message telling you that copying of multi-range selection is not supported (or something to that effect). You can’t just copy a random set of ranges of varying sizes, however. Because the data gets pasted as a single range, all copied ranges must have either equal column size, or equal row size, or else you’ll be greeted with an error message.